What is happening? Where did everybody go? Why am I left here? Is there any hope? These questions are some you might be asking if you miss the first phase of the Second Coming of Jesus Christ to the earth, called THE RAPTURE! Peace will reign for 3 1/2 years. Then, in this I time called The Great Tribulation in Rev. 17:14, all of God’s judgment will be meted I out on this world as Satan’s emissaries, the I I beast, the anti-christ, and the false prophet I wreak havoc on mankind. Revelation 16 records 7 great judgments I poured out on a God-forsaking world and I its Satanic leaders! Putrefying and painful sores, seas of deadmen’s blood, rivers filled with blood, and the stench of dying aquatic life will plague man and beast. The sun will scorch the flesh of blasphemous man, and then disappear into the blackness of full darkness, as men gnaw their tongues for pain. The Euphrates River is dried up and God sends great earthquakes, tremendous thunderings, and lightnings, as huge hail stones pound the remnant of earth’s inhabitants. “It is done”, thunders from heaven as God’s wrath is satisfied. And then, the second phase of Christ’s Second Coming transpires! THE RETURN. “… the coming of our Lord Jesus Christ with all his saints. ” IThessalonians3:13b He comes and defeats the armies of the anti-christ. The Lord Jesus will then reign for 1000 years! You say, “I just can’t believe it. I’ve so many questions.” Let’s allow God’s Word to answer them for you. 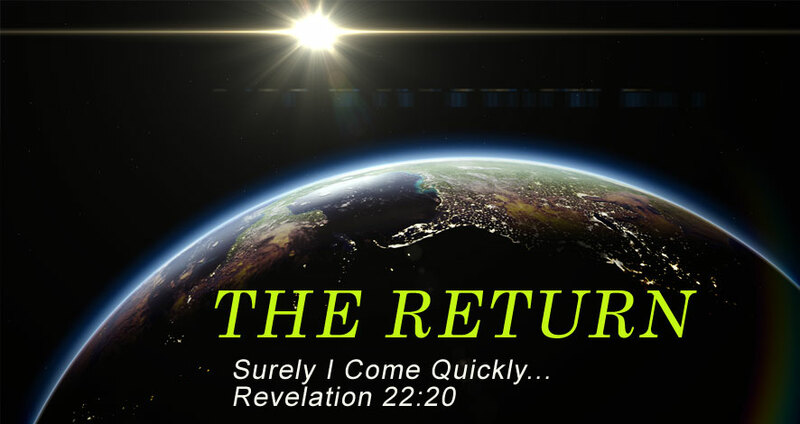 WHEN WILL THE RAPTURE TAKE PLACE? SOON! “Then shall two be in the field; the one shall be taken, and the other left.”Matthew 24:40. If you miss the rapture you will be left behind to go throughthe Great Tribulation, then, as a deluded non-believer, you will end up in hellfor all eternity. “…I will come again, and receive you unto myself; that where I am, there yemay be also.” John 14:3b. Jesus Christ would not lie. He promised to come again,and He will, for those who are ready, THE SAVED. WHAT SHOULD I DO? REPENT – BELIEVE-BE SAVED!! “Repent ye therefore, and be converted, that your sins may be blotted out, ” Acts3:19a. “…Believe on the Lord Jesus Christ, and thou shalt be saved, and thy house. “Acts16:31b. “For by grace are ye saved through faith; and that not of yourselves:it is the gift of God:” Ephesians 2:8.